Personality Mapping is only for highly emotionally-intelligent couples or individuals who want explore the inner workings of their marriage and understand how certain interactions go so well and others don’t. You are the couple that wants to increase your personal and inter-personal skills, and to model an authentic, successful marriage to your kids. During childhood we create maps for ourselves that frame our realities and shape our behaviors, often for the rest of our lives. As we grow into adulthood, these personality maps are carried into our personal and work lives, affecting how we express ourselves, interpret our emotions, and interact with others. Connect2® Personality Mapping for a Couple is a confidential, experiential process that lasts 2.5 to 3 hours and is done in one or two sessions. Connect2® Personality Mapping is a powerful guided process designed to explore the layers of the physical and psycho-emotional Self. It is a way of illuminating an individual’s intra- and inter-personal relationships, which may include one’s own– and often previous generations’–unfinished business. During childhood we create maps for ourselves that frame our realities and shape our behaviors, often for the rest of our lives. These early maps are grounded in our genetic predispositions and shaped through our earliest childhood experiences, including interactions with parents, grandparents, siblings, and other significant people in our lives. They carry important information on what is acceptable and what must be hidden in our lives. Myers-Briggs tells you what your personality style is — Personality Mapping shows you how you got here, highlights where you want to go and what might be slowing you down. The goal is to develop tools to live a successful, authentic life, and change your brain along the way. Please call 650.847.0030 or email canderson.connect2@gmail.com to reach me to speak, teach and/or present Personality Mapping. 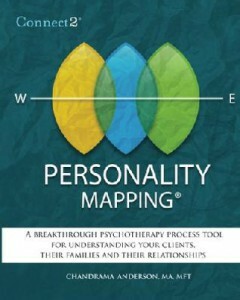 Please check out my book: Connect2® Personality Mapping: A Breakthrough Psychotherapy Process Tool for Understanding Your Clients, Their Families and Their Relationships. Available at Amazon.com.